This is a young Eastern Imperial Eagle (Aquila heliaca). The purpose of my blog is not to offer accurate taxonomy or deepen into the biology of any given animal I happen to photograph, although being concise does not mean saying: "this a bird!". 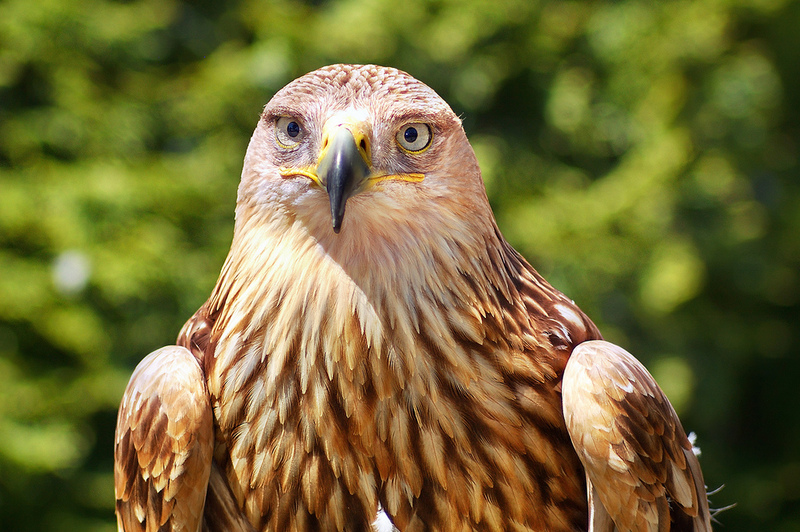 The eagle is one of the many species of birds of prey that can be admired at Cim d'Aligues, a special center on the hills of Sant Feliu de Codines near Barcelona. There is an old post with a link and some further explanation about Cim d'Aligues (Eagles' Peak). If you have time try to reach this town. There is a magnificent view of the valley once you are inside the aviary. During the day there is a show where trained vultures, owls, hawks or eagles are released and claimed with bait using falconry techniques. You can admire them gliding over your head and exploring the neighboring lower areas. They take some time to return but eventually they are all back. Saying "This is a bird" would probably be ok when the bird photo is this spectacular! The detail is amazing, and you can see the power of the Golden Eagle in its eyes. I love this......yet another post making me long to someday see your part of the world. This is an amazing image, so detailed. That's a very nice shot. I'm seeing a golden eagle for the first time, even though in a picture! Thanks for sharing!